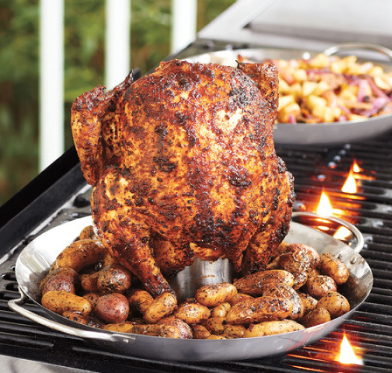 Beer can chicken making gadgets come in all shapes and sizes, but rarely do they double as anything else. Which is usually fine: the idea is to add a flavoring liquid of your choice (that’s right—gasp—it doesn’t have to be beer) and let it bubble up and permeate the meat while it is cooking. Results are tender, delicious and juicy. 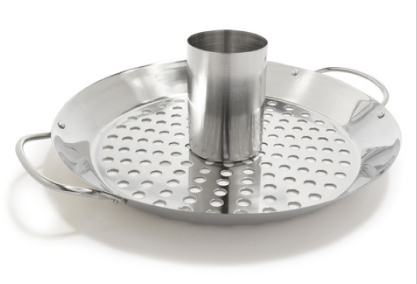 Joined with another popular grill accessory–baskets of all shapes, sizes and functions–the Combination Vertical Roaster and Wok brings two favorites to the grill. As a wok the secondary function of this grill accessory may be questionable, but when thought of as something closer to a grill basket or pan, it is spot on. The perforated base of the stainless-steel, dishwasher-safe grillware is perfect for easily lost grillables like vegetables, which are undoubtedly better in the pan than in the fire. Timetable says: Hurry up and eat!